I replaced my old analog TV with a new flat screen. I used a mounting bracket that I bought at Wal Mart. The kind that swing out and tilts up or down. 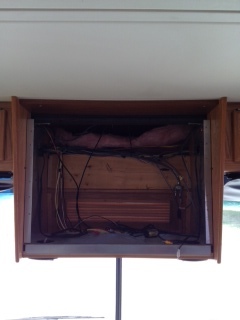 My question concerns how to keep the TV from coming forward during the shaking and rattling of travel. What did any of you do who have replaced your TV with a flat screen? I'am at a loss to figure this one out. When we switched over, in our '99 DP, we mounted the new flat screen on a swing out mount similar to what you describe and since the new TV was about 2" wider than the opening for the old TV I put 3/4" foam self stick weatherstrip on each side of the back of the TV to keep it from rattling during travel and used a 1" nylon strap anchored inside the center top and bottom of the cabinet. When getting ready to travel, I simply swung the TV against the cabinet and pulled the nylon strap tight enough to put a little tension on the foam rubber pads on each side. It travelled well for a couple of years until we changed coaches. 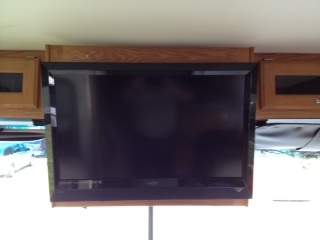 We replaced the TV in our 2002 Winnebago Adventurer with a 26 inch flat screen on a pull out mount like to yours. in the back of the TV cabinet when we are traveling. It works great and at our destination we just unhook the cord. You can see pictures of my 32 inch TV installation HERE. A couple of the pics at the end show the travel hold down bars I made. They have been use for three years and work well. Clay, that is a nice job on your conversion. You may want to check out http://www.rvcams.com/Default.htm when it comes time to replace that old rear view camera. Don, I used a stationary mount for my flat screen when I converted over to flat screens in bedroom & living room. You can also check into using hook & loop straps to hold your TV in place while traveling. Location:Where I hang my hat! We replaced both front and rear TV's with LED and LCD models and used the swing out and tilt up/down brackets you mention. They work great. The bedroom TV is such an angle that it never moves out of the original cabinet. The front 26" is another story. Plus I tilt it down quite a bit to use it as a backup camera monitor when driving. To keep it in place we got some black 1" width Velcro. Taped a length to each side in the back and on the cabinet walls so it doesn't show. Works perfect. We undo the Velcro and move the TV back into the front cabinet since we don't use it when parked which is between one and six months at a time. Picture quality not that great. We got a 32" Sony LCD to mount in place of the 26" LED model, but found we like it better sitting on the dash area. When moving we put it next to the sofa out of the way. We find we don't like to watch TV for hours while "looking up". I also replaced my analog with a digital with a swing arm similar to yours. To ready it for travel, I take the styrofoam pieces that came in the box for the tv and place it on the top and bottom of the TV and then wrap two bungee cords around it. I then attach the outermost bungee cord to a hook mounted on the cabinet behind the TV so it does not swing out when going down the road. After changing my CRT TV to a LED TV I found that my TV would vibrate forward and start rattling. I built a resting place for the TV but that wasn’t enough to keep the TV from tilting forward as we travel. I added a sound bar above the TV so I was able to make a wooden clip with a notch that I fit behind the sound bar and in front of the TV. 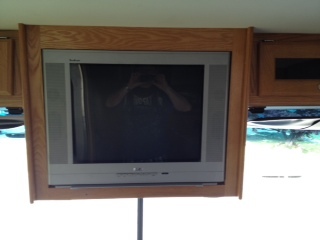 The clip keeps the TV in place and keeps it from making noise as we travel. Here are pictures prior to making the wooden clip. I just uploaded pictures of the wooden clip. They can now be seen in the link above. Don't say you haven't been warned. The use of bungee cords can be hazardous to your health. I know someone who lost a tooth when a bungee fought back. I'd much rather use velcro. I just recently updated to 32" TV up front. I chose the MorRyde TV mount for this installation as it can be pulled out for access behind the TV and when moved into the viewing/travel position it provides a positive lock with no other cords or straps required. A bit pricey, but worked like a charm. Note from Moderator: Link corrected. Thanks, Bill. I believe you might have meant http://www.tvformyrv.com/ . They sell many of the Mor-Ryde mounts including the one that I used and the one you are referring to. 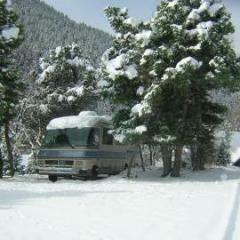 I have a 2002 Winnebago Journey. I would like to replace the front and rear Tvs. I am not sure I want to tackle this my self. I live in Michigan does anyone know of a good place to have this done. I am wanting to make this change as well, but I am worried about the winter months when the coach is not being used. In the winter months it is not that uncommon to have lows in the low 20's, even mid teens. I've asked several sales associates at different stores which ones stood up better to low temps, LCD or plasma and none of them seem to know. Depending on where you are at in Michigan, this place is in Elkhart, IN. I have only reviewed their work on line, but it looks nice. I replaced ours with an LCD two years ago, and it has weathered two winters where the temps get to -10. No problems yet. I would be wary of the plasma Tv's because they are more temperamental. If they are layed flat for any length of time it can damage the display. teamrope - Samsung has the following to say. I suspect other brands are similar. Fortunately for me in Georgia, this is good enough. "Samsung LCD TVs can operate safely in rooms or areas in which temperatures range from 50° F to 104° F (10° C to 40° C). Temperatures outside the listed range will negatively affect the operation of your LCD TV. Samsung LCD TVs can be stored unused at temperatures ranging from -4° to 113° Fahrenheit (-20° to 45° Centigrade). Storing your LCD TV at temperatures outside this range can damage your TV." I just finished upgrading to a flat screen. I used a swing arm mount fastened inside the box nearest the center of the cabin. This allows me to swing the screen into the center of the cabin for easier viewing from the couch. I was able to set the TV high on the mount which, on the mount I purchased, left about 1 inch and one screw hole in each bracket hanging out below the TV itself. I sawed off the bottom of the old TV frame to make a perfect cover for the extra space and I attached this cover to the mount holes. That gave me a solid oak 1 x 2 across the bottom of the TV. Next I mounted two oak 2 x 2 x 4 cleats on the back of this oak trim such that when the TV was properly placed over the front of the old cabinet the entire system was supported by these two cleats. Finally I added a keyed barrel type cabinet lock in the center of the 1 x 2 and a latch plate in the bottom of the old cabinet. Now when I close the cabinet I must get the TV properly centered and lift slightly to get it to close completely then I turn the key to lock the unit in place. I adjusted to lock such that if the TV is not within 1/4 inch of the proper place, and completely closed, the key will not turn to the lock position. This makes sure I/someone has properly stowed the TV otherwise, there is a key hanging in front of the driver. I did this last week and only have about 200 miles on the system, but so far so good. My wife is making a small curtain to hang from the curtain rod in installed mid cabinet to hide the clutter in the back of the cabinet when the TV is in viewing position while still allowing the wires and swing arm to move properly. One - The new TV's do not play well with the old DHS sound systems used in many coaches, so if you want to have some sound output other than the speakers on the TV you will likely need to replace the sound system as well. Replacing the TV was relatively easy. Installing the home theater sound system was the hard part even using the existing speakers I had the three cabinets, dash, and side panel open for a couple of weeks. Two - When you remove the old DHS sound system your dash radio will stop working so you will need to accommodate that change as well. I chose a home theater system with a radio and added my Sirius Satellite unit. 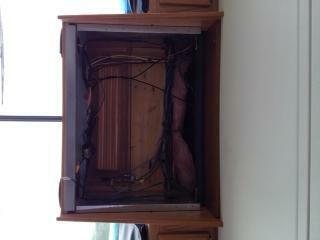 And one word of warning, those old "fat" TV are heavy. Be sure to have help when taking the monster from the cabinet. I replaced the two old TVs in my Monaco Monarch with Flat Panel. Did not do any real cabinet mods just some basic trim work. Not much of a carpenter so did not try to reduce the size of the box up front. Used plywood in the back and 1 by 10s up front. Added security straps on each. Local RV shop want $500 for just the front one.